I had the HUGE pleasure of spending time with Balcones head distiller Chip Tate this past weekend. After a marathon 6 hour talk-fest on Friday (interspersed with food and whisky, of course), we picked back up Saturday evening to do a ridiculously fun whisky “tour” of lower Manhattan (Angel’s Share, Astor Place, Brandy Library, you get the idea) where I got to play sidekick to him sharing his mighty fine spirits with the owners & sommeliers of these lovely establishments. Here’s the inside scoop – the always interesting, super smart Mr. Tate was here finalizing his NY distribution channel. Bottom line: BALCONES All-American Texas Craft Whiskies WILL SOON BE AVAILABLE FOR SALE IN NYC! Woohooo!!! 1) Balcones makes everything themselves by hand, Chip even made the copper stills (yup, he welds copper). 2) They are the only distillery using artisanal Blue Hopi Corn (as opposed to generic white or yellow corn) which lends a much more refined and rounded flavor to their spirits (think Kraft Mac ‘n’ Cheese vs a gourmet Mac ‘n’ Cheese made with Gruyere & a bit of bacon … riiight). Makes a difference. Try the Baby Blue whisky or the cask-strength version, True Blue. 3) Small barrels lend a hint of those caramel & buttery notes we love from oak-aging but Chip doesn’t let it overpower the corn notes. The finished products are perfectly balanced with layers upon layers of delicate flavors. 4) One of the products in their line-up is Rumble. It’s fermented Mission Figs, Texas Wildflower Honey & Turbinado Sugar. On the nose, I find an interesting bouquet of rich honey, iris flower, and a hint of smoke/black tea. At 47% abv, this is no wimpy spirit – but it’s really fun to drink and experience the flavors rolling over your tongue. There is no category for this product. It’s its own thing … kind of like Balcones. 5) Last but not least, I need to mention the Brimstone whisky. He smokes the whisky. Let me repeat, he smokes the whisky – not the grains – the actual distilled liquid. It’s a secret processes, rightfully so, and he’s smoking his blue corn whisky with Texas scrub oak. Let me break it down further: it’s Texas BBQ in a bottle… with a side of corn bread. You just need to try it for yourselves. It’s a very unique experience and in my opinion, it rocks. A nod to tradition fueled by their independent & adventurous drive. Job well done. Welcome to NY. PS – I also confirmed my visit to his Texas distillery in September… Stay tuned! This sounds like some really interesting and flavorful whiskey. Do you know whether they will be distributing nationally? Think they’ll be at a few of the big whisky festivals? The Rumble sounds particularly interesting. Figs, honey, and sugar. How could you possibly go wrong? Looking forward to hearing about your Texas trip! Let me know if you ever get your hands on some – I’d be really interested in hearing your thoughts. What a beautiful way to describe what a craft distiller can do. Now I really need to try this fabulous sounding stuff. Awesome sounding evening and a terrific description of some very interesting sounding whiskeys (and fruit eau de vie / rum stuff). The Brimstone, in particular, intrigues me. Do you have any updates about NYC distribution? Thanks for stopping by! Yes, Balcones is being distributed through Martin Scott in NYC. You should be able to find the Brimstone at DrinkUpNY.com, Astor Wines, Le Du’s Wines… etc. « TASTE Balcones Whisky at Astor Place TONIGHT! 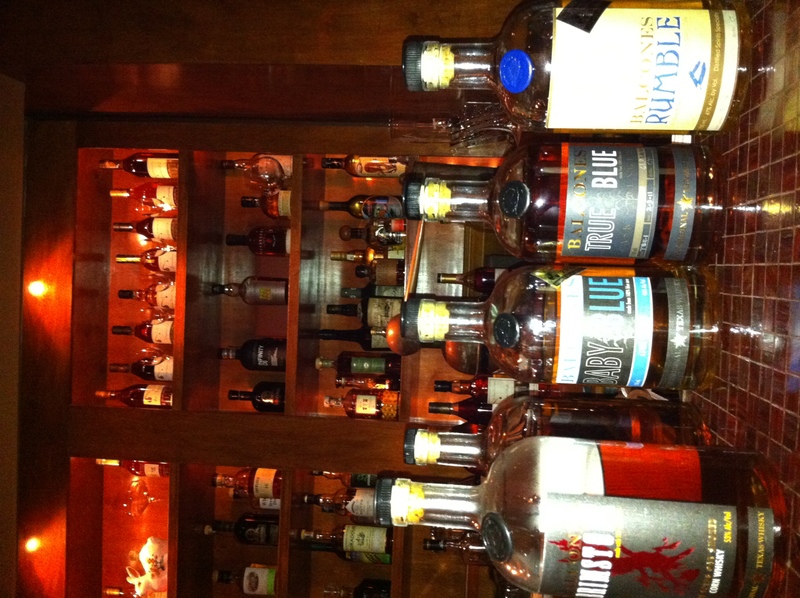 You are currently reading Head distiller Chip Tate + his Balcones whiskies = one awesome weekend at The Whisky Woman.